The 12' Blocker Lead Rope is specially designed to have the proper weight and swing to use as a training tool or everyday lead line. 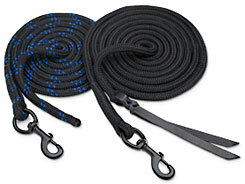 The rope comes with a durable spring snap, has low stretch and is abrasion and snag resistant. The 12' lead rope comes with a popper for use as a training tool.